Admittedly, winter is the prime time for Soup Night: there’s the warmth of the bowl, the warmth of the red wine, the warmth of being inside, the warmth of the general coziness. But in summertime, Soup Nights come with white wine, fruit desserts, bare feet, and soups served cold. It’s just as fun. As we learned when my dad came to town, the best way we know to honor a guest is to throw a Soup Night for him/her/them. This time, Ryan’s parents were in town, which automatically signed us up for some of his Ma’s Gazpacho, a longtime favorite in his household. My brother Rob was in NYC too. He doesn’t have enough kitchen years in him to have a recipe named after him yet — give him time, folks, I’ve no doubt there’ll be one soon — but I couldn’t escape all of those summer memories as a kid of shucking corn with him and my other brothers. I ended up with a chilled corn recipe, taken from last month’s Gourmet, but doctored heavily. When I did the soup test run the weekend before, the soup was deemed to thin (would slosh easily, wouldn’t feel substantial) for a Soup Night contender. Yet, the more I looked at corn recipes, the less I could shake it’s chilled simplicity. I decided to experiment. After consulting some food-savvies, I went with a combination of their suggestions: Added a roux, added a potato, added some cream. Both soups were deemed delicious. Success! -Blend until almost smooth. Chill. *for this Soup Night, we substituted vegetable broth for our lovely vegan friends. Garnish: sour cream and chives. I also recommend: dill! – Cut kernels from cobs with a sharp knife, then cut cobs into thirds. – Cook onion and garlic in butter with 1/4 tsp salt in a large heavy saucepan over medium heat, stirring occasionally, until onion is softened, about 5 minutes. Add corn and cobs, water, and salt and pepper to taste and simmer, uncovered, 20 minutes. – Discard cobs, then puree corn mixture in batches in a blender until very smooth. Force soup through a fine-mesh sieve into a bowl, discarding solids. – Chill until cold, at least 1 hour. 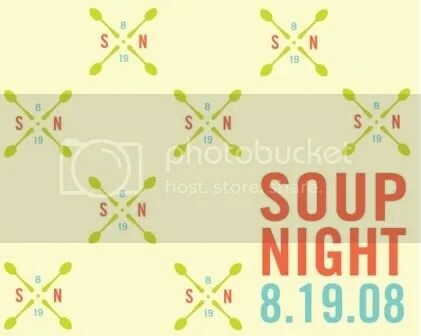 just for the record, the flyer for this soup night was HOTTTTT! i’m just saying, ms. lasoup, this throws into sharp relief just how long it’s been since there was a soup night.